Superheroes like Batman, Spiderman, and Superman have been around since the Golden Age of comic books in the mid 1960s when they really started to gain in popularity and take off in sales. Millions of children around the world fell in love with the artwork and stories as their imaginations ran wild fantasizing about a distant universe. These days there are tons of comic book themed slot games being released and you’ll find all of the best ones reviewed on this website. Of course, they’re extremely popular now because all of the kids who grew up reading them have become adults who like to partake in more “mature” things like internet gambling. It totally makes sense that software companies are tripping over themselves to release them as quickly as they can. Here is our full list of comic book slot reviews for you to enjoy. Please note that each of them is based on graphic novels and not the major motion pictures who share their names – all of those ones will be listed with our movie themed slot reviews in a different section. Before seeking out a gambling game based on a comic book it’s always important to verify if it’s inspired by the comic book itself or on the movie about the character because there’s obviously a huge difference between the two. For example, the version of Wolverine Slots that was made by Playtech a few years ago isn’t based on the wildly successful movie character played by Hugh Jackman and the story is actually taken from the graphic novels, (although there are some elements of that game that will remind you of an old X Men video game for the Sega Genesis). So for anyone who’s played that particular one looking for a bare-chested Hugh Jackman symbol, we’re sorry to tell you that it doesn’t exist. As always, before you put one cent into a machine make sure it’s the one that you’re actually looking for. The Marvel Universe of superheroes is led by its most popular characters Spiderman, Hulk, Captain America, and everyone’s favorite sarcastic billionaire, Ironman. In addition, many would argue that they also have the most engaging, interesting and diabolical super villains ever created, such as Red Skull, Ultron, Doctor Octopus, and Green Goblin. Marvel really took off in the 1960s due to their plot lines that reflected the turbulent times unfolding in America. They brought in real life fears such as communism and the Viet Cong and as a result, they attracted readers who were outside of the usual demographic of under 14s: adult males were now buying comic books in droves. Although young girls (like me) were also starting to take notice. This vast pool of characters and history on which to draw upon always means that Marvel slots are released to much fanfare and are praised by the player community. The software developers know how passionate Marvel fans are so they’re always careful to remain true to the stories and characters. They know that anything but the best will draw a loud chorus of boos from the Marvel faithful who will shun the game into obscurity. 2019 UPDATE: Since the Walt Disney Company has purchased Marvel and they are very conscious of their “family-friendly’ image, they have discontinued all slot games based on the characters. This includes Wolverine, Spiderman, Ironman, and everyone else in the Marvel Universe. We will update you as the situation changes. Most “experts” of graphic novels claim that DC Comics has always been the equivalent of Marvel’s “goofy younger brother” who tests their readers patience with fanciful plot lines and characters. This is primarily due to the fact that DC has traditionally had “lighter” stories that are targeted towards a younger audience. However, since 2018, DC has been the only company releasing comic book themed slots so now they basically corner the market. Of course, there are some niche heroes who star in games like Hell Boy Slots who aren’t a member of either of the big two companies. Ultimately, it could easily be argued that without Batman, DC Comics would have folded years ago if they were forced to be dependent on heroes like Aquaman and Shazam! to drive sales. Simply put, DC has always been the “American Apple Pie” to Marvel’s band of “Jaded Misfits” who stumbled over their personal shortcomings to protect the world. People then gravitated to the universe that suited them best. That said, any story that involved DC’s best characters combining to form the Justice League of America was always a great one. 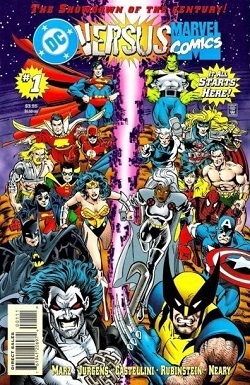 Superheroes leaving their respective story lines to come together and join forces to fight evil was one of the best ideas that the company ever had. Batman, Superman, Aquaman, and Wonder Woman all on the same team was just too cool of a premise not to become emotionally invested in, and the “Super Friends” cartoon that aired in the ’70s and ’80s was simply wonderful. Did anyone else watch this show back in the day? It’s definitely one of the best television adaptations of a comic book ever.